Homemade ice cream is a real treat. There are endless options that you can try. I have been dying to try my hand at dark chocolate ice cream. 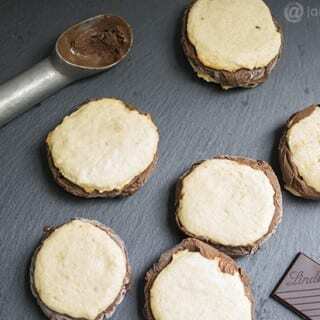 To make it fun I decided to make ice cream sandwiches. I took to my Vegan Ice Cream Sandwiches book for a good combination. I decided on banana cookies but wanted to try my hand are dark chocolate ice cream with the new Silk Almond Coconut blends. I'm normally an almond milk drinker but I love the taste of coconut so this was the best of both worlds. We aren't vegans but from time to time we like to cut out certain ingredients to make a healthier meal. I also have family members that have allergies so this is a great substitute. You can grab a coupon for Silk on their Facebook page now. I started with the dark chocolate ice cream. I started it in the evening and finished it up the following day. Start by melting the 70% dark chocolate that you chopped up in a double boiler or in the microwave in 30 second increments until it's completely melted. Then in a separate pan heat (low medium) the Silk Almond Coconut blend and the fat of the coconut milk in a heavy bottom sauce pan. Whisk in the dutch processed cocoa powder with the milk until well blended. Add the agave and the melted chocolate until it's well blended and incorporated. remove from heat and add the vanilla. Allow the mixture to cool completely. Time to make the banana cookies. Cream together the mashed banana, sugar, vanilla, and margarine. Whisk the flour, salt, and baking powder together in a separate bowl. Slowly add the dry ingredients with the wet until blended. Spoon a tablespoon sized amount onto the baking sheet and use your fingers to press it down to make a flat cook. Banana cookies are always fluffy and don't melt down like other cookies do. Bake the cookies for 9 minutes and then let them cool on the pan. After the ice cream mixture has cooled completely, place it in you ice cream maker and mix to the manufactures directions. 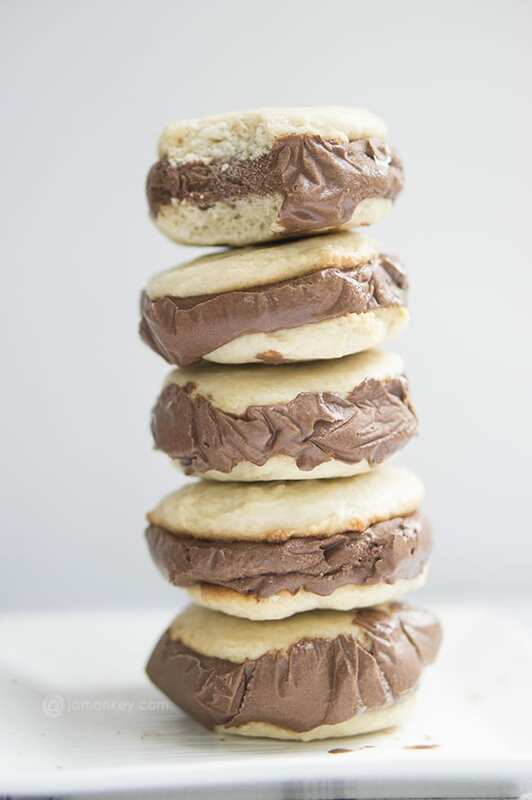 When it becomes hard, use an ice cream scoop and place one scoop in between two cookies. Press them together until the ice cream reaches the sides. Wrap in saran wrap and place in the freezer to further harden. 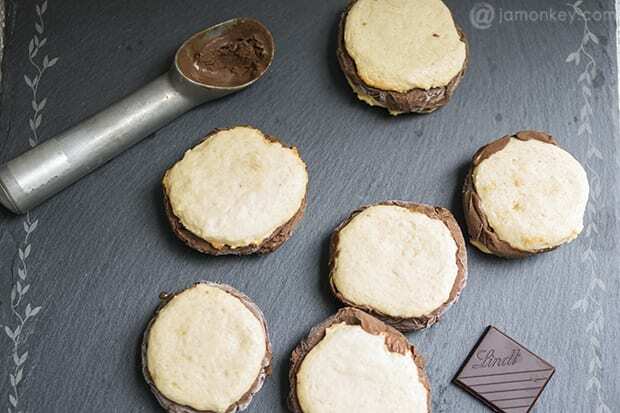 You can also get creative and roll the outside of your ice cream sandwiches in something yummy like almonds, chocolate chips or sprinkles. Either way they are supper tasty. 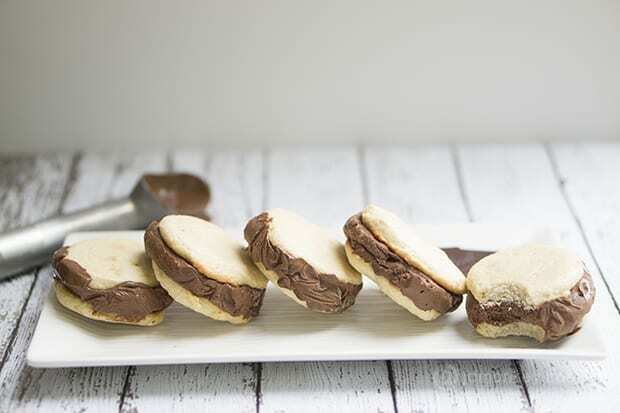 I can't wait to try some of the other recipes in the Vegan Ice Cream Sandwiches recipe book. Next on my list is the Chai Chowdown Sandwiches. Make sure you try out the new Silk Almond Coconut blend or their new Protein blend. Grab the coupon on their Facebook page. Share your thoughts below! Do they look tasty? Preheat the oven to 350 degrees. Line two boing sheets with parchment paper. In a medium bowl, combine the flour, baking powder, and salt. In a large bowl, cream together the sugar and margarine. Add banana and vanilla, and mix until smooth. Using a cookie dropper or tablespoon, drop tablespoon-sized scoops of dough on the prepared baking sheets about 1 inch apart. Bake for 9 to 12 minutes, until the cookies have spread and the edges are set and lightly golden. Remove from oven and let the cookies cool on the pan. 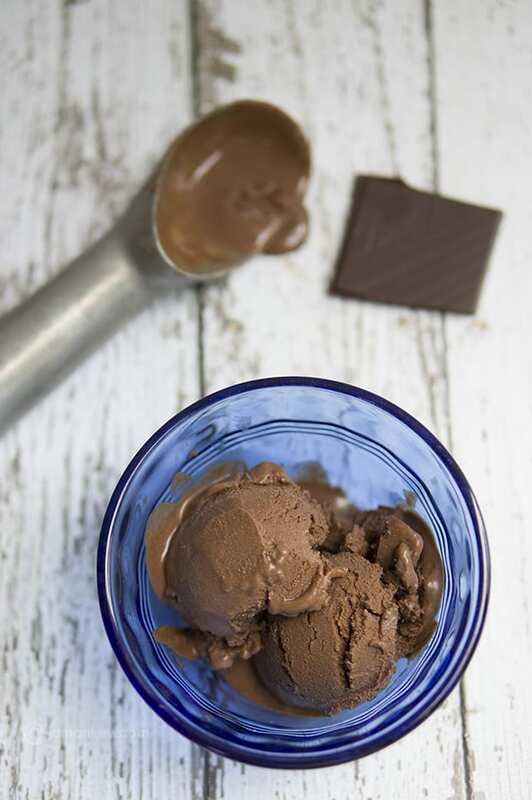 Chop dark chocolate and melt in a double boiler or in the microwave in 30 minute increments. Heat Silk Almond Coconut blend on low medium heat with fat off the top of the can of coconut milk. Add cocoa powder and whisk until blended. Add agave and melted chocolate and continue to whisk until well blended. Follow the manufactures directions and make your ice cream. Once hard scoop onto the cookie and squish it together until the ice cream reaches the edges. Wrap in saran wrap and freeze until hard. These look amazing!! Already pinned it so I will have this recipe handy! Thank you for sharing!